Traditionally, NFL Media will roll up a fairly comprehensive truck compound to establish its tech presence during a Super Bowl Week. 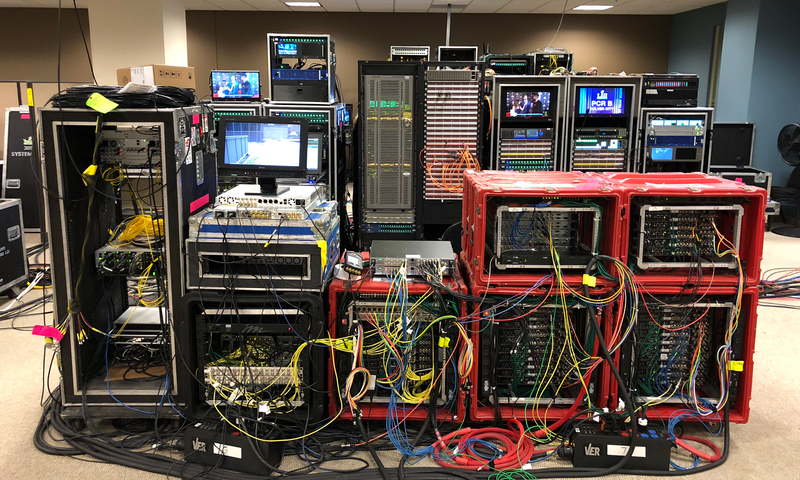 This year, however, it’s deploying more of an Olympics IBC model: the company secured a large, 18,000-sq.-ft. office space in the basement of the IDS Center in Downtown Minneapolis to serve as its media nerve center — with the help of a flypack provided by VER — for Super Bowl LII. A flypack provided by VER (background) is the nerve center for NFL Media’s presence in Minneapolis for Super Bowl Week. NFL Media has established a home base in a 18,000-sq.-ft. space in the basement of the IDS Center. It’s a setup unlike any that NFL Media and Shaw, VP of production, have enjoyed before, and they are certainly enjoying it. Future Super Bowl host committees may want to take note. The space, previously the home of the now defunct Globe University, had an open area where cubicles previous sat and which was the perfect size for dropping the flypack. Offices and classrooms have been repurposed as video rooms, control rooms, edit suites, conference/meeting rooms, catering rooms, and more. The main purpose of the area, though, is to serve as a fiber-connectivity center, pulling in all of the feeds from Nicollet Mall, the Convention Center, and other locations throughout the Twin Cities and integrating with NFL Media’s home offices in Culver City, CA. Also being monitored from this space is NFL Media’s aerial-cable-camera system above Nicollet Mall. Provided by SupraCam, the camera is a staggering 3,200 ft. above the street and spans nine of 10 city blocks in Downtown Minneapolis, providing picturesque views that NFL Media is even sharing with Super Bowl LII game broadcaster NBC Sports for bumper shots in and out of break during pregame coverage.